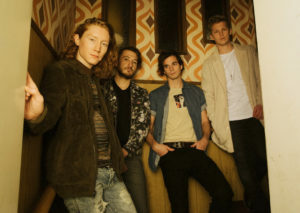 THE WHAT: What do we like about flor? Yes, we like the fact that the Oregon-native band comprised of Zach Grace (vox/guitar), Dylan Bauld (bass), McKinley Kitts (guitar), and Kyle Hill (drums) transplanted themselves here to Los Angeles, but we’re particularly fond of the deliciously synthy and groove-laden alt-pop that they traffic in. We also think their penchant for lowercase stylization is cute. And then there’s their latest release, “slow motion” – the first single from their upcoming sophomore album due later this year via Fueled By Ramen – a glimmering, soft, sensual, and aforementioned groove-laden piece of sound. As for the Jade Ehiers-directed video which finds the band ever so gradually being buried, it seems an apropos visual metaphor for a song about succumbing to love. THE WHERE: Having just wrapped up a healthy tour with Andrew McMahon in the Wilderness, on May 2nd flor kick off their own headline dates throughout the UK and Europe. So keep up with flor and check out those tour dates via the usual places such as their official website, Facebook page and at @flor on Twitter.